If wind chill can make the air feel a few degrees cooler, today’s sky made the weather look 20° colder. I don’t know how people living in Nike country do it because gray skies can psych me out. I bundled up though and headed out to Heil Valley Ranch for a mountain trail run before noon. I wore tights and a long-sleeve compression turtle neck along with a skull cap, gloves and my North Face shell. I didn’t feel the wind starting out and wasn’t sure if I needed the gloves. I did end up removing them after only a mile but my shell has great pockets for easily stashing discarded gear like gloves. There was a little wind on the north side of the hill but this was some excellent running weather. There was some light snow flurries which made the run more scenic. I’d have been fine without the tights too but they helped me overcome my mental resistance to going outside. So glad I got out there today. There were a surprising number of hikers and bikers on the trail today. I didn’t encounter other runners until coming back down in the final two miles. I ran by the biggest group of mountain bikers ever – must have been a dozen of them at least. They were coming up the Picture Rock Trail although I encountered them on the Wild Turkey Loop. 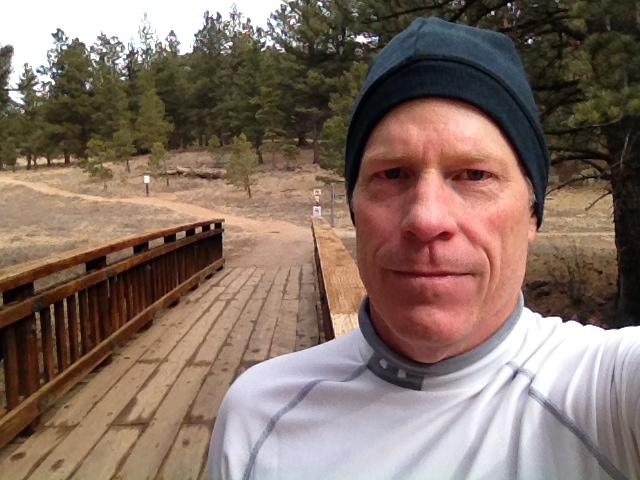 I ran the Wild Turkey Loop, which is three miles, and came back down the Wapiti Trail making for a six mile run. As slow as I was going, felt more like a ten miler. I also saw a record number of deer on the trail today. Lots of bucks. One was a big daddy and he didn’t bother to scamper off as I passed him like the others. He kept his eyes on me. Even more amazing though was the gang of 30 or 40 wild turkeys that crossed the trail in front of me on my last quarter mile. This would have been more perfect on the Wild Turkey Trail but technically at this point I was on the Lichen Loop. Still, great day for wildlife.